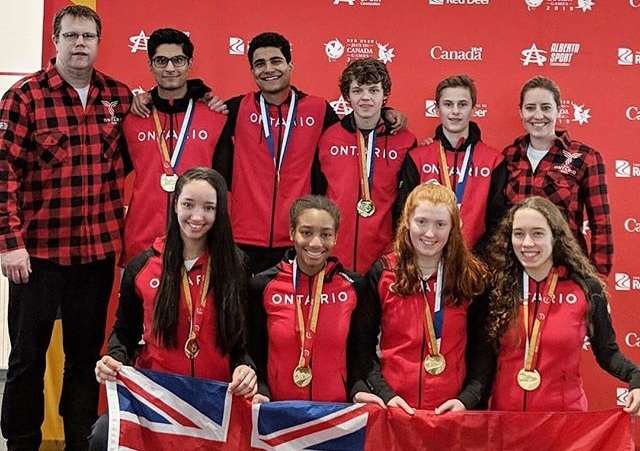 Rea Godbold of the Toronto Racquet Club, Sydney Maxwell of the Cricket Club/Queen’s University and Ontario’s double gold medal winning Canada Winter Games Junior Team highlight the many incredible Ontario performances in January and February 2019. Please join Black Knight and Squash Ontario in congratulating them on representing their province and achieving excellence. Rea Godbold, along with partner Michael Manley of the TRC staged one of the largest upsets in recent history by winning the 2019 Ontario Men’s Veterans 70 plus division on their homes court. By doing so, they edged out multi-time Canadian and US Champions and legendary teams Potter/Wheeler and Swift/Robertson in round robin play that was determined by games. Godbold gets the nod for Player of the Month over partner Manley by virtue of also earning a silver medal in the Hennessy and Hinchcliffe Ontario 65+ Mixed Doubles championships with partner Heather Ferrier. Other notable male performances from the period include Team Ontario Senior Men and Masters Teams (Nick Sachvie, Mike McCue, Graeme Schnell, David Sly, Don Lee, Scott Kemp Gee and Walter Bentley) as well as OUA Male player of the year Josh Hollings of U of T.
On the female side, Sydney Maxwell is in line for a new trophy cabinet after filling it during a very busy winter. Maxwell posted a spectacular 12-0 record en route to leading the Queen’s Golden Gaels to their 3rd consecutive OUA title, earning OUA player of the year honours and capturing the 2019 Canadian University Championships all in the span of a 5 weeks. An upset semi final appearance at last weekend’s McWil Ontario Open, her first ever PSA appearance put an exclamation mark on a dominant period. Honourable mentions go to 2018 Winter POM winner Sybille Witt who captured a gold medal in the Mixed 65+ and silver in the Women’s 60+, Robbin Morrison who took home gold in the Women’s 50+ and silver in the Mixed 50+ and the female members of Team Ontario Masters (Nicole Garon, Lisa Bogdan and Elka Markus). On the junior side, there is no more appropriate group to be recognized then our 2019 double gold medal winning Canada Winter Games Teams. Led by coaches Allan Cook and Tara Mullins, this special group of juniors vindicated Team O that barely missed out on the feat in 2015. Our boys team did not drop a match throughout team play and were led by individual gold medalist Liam Marrison and included silver medalist Neel Ismail, Nikhil Ismail and Dylan Deverill. The girls squad had to dig deeper on their path defeating BC 8-7 in games in the final and featured Individual silver medalist Charlotte Orcutt, bronze medalist Brianna Jefferson, Molly Chadwick and Salma Mounir. Congratulations to all of our Ontario athletes for another championship stretch on the courts!